I never usually get round to doing an 'empties' post as I am quite ditzy and end up throwing them away throughout the month but I remembered this month, hurrah! I will link my original review, if I did one, next to each product, also please excuse the terrible lighting it is an extremely miserable day today, rain, rain and more rain! 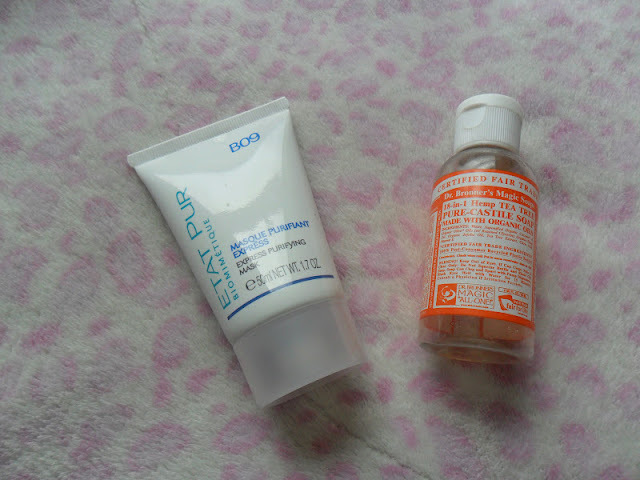 Etat Pur Face Mask - I received this in a Joliebox a few months ago and I really enjoyed using it although I don't think I will be repurchasing as I have found a gorgeous face mask from Superdrug which I recently posted about recently for a fraction of the price. Etat Pur retails for £7.50 for 50ml. Dr Bronners Magic Soap (link) - I raved about this product after I heard great reviews about it when people received it in a beauty box last year.My oily skin loves it, it helps keep excess oil at bay and has reduced my black heads, this tiny little bottle lasts forever and I bought it from Ebay for around £2(ish) this is a MUST if you have oily/combi skin. I have already ordered some more! 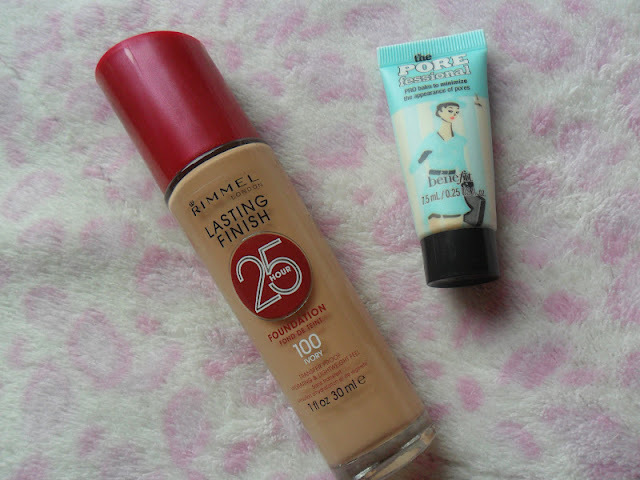 Rimmel 25 Hour Foundation (link) - I am extremely happy with this foundation, it retails for around £7.99 depending on what offers Rimmel has on, but this is a fantastic cheaper alternative to my other fave foundation Estee Lauder Double Wear, I will definitely be buying this again! Benefit Porefessional - This was a freebie from Glamour magazine some months ago, the product is silky smooth to apply and acts as a great base for your makeup, to me though it was not that amazing that I wanted to spend £23.50 buying the full size product, sorry Benefit. 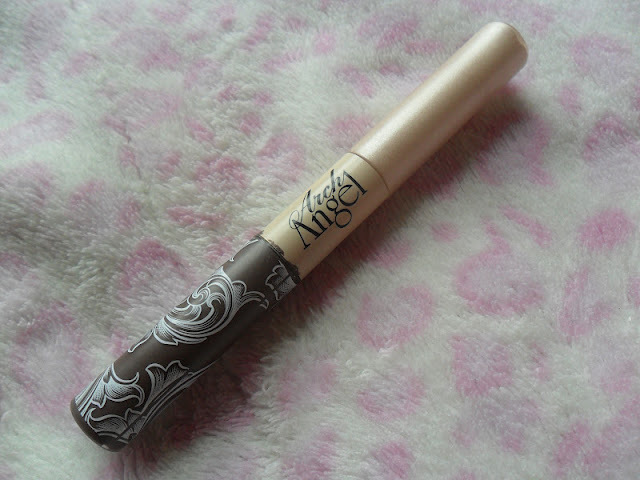 Mememe Arch Angel (link) - This product I adore! My brows are always nicely groomed and highlighted thanks to this little beauty, it costs £8.50 but it's on offer in Superdrug at the moment for £7.50, so I snapped another one up! Nivea Invisible Deodorant - This product to me is rubbish! I was sooooo disappointed with it. I usually use Sure or Palmolive deodorant but this Nivea one was on offer so I thought I would test it out. It claims to last 48 hours (?!?!?!) I shook the bottle as usual and every time I used it I had white marks, not only that the scent didn't last for a few hours let alone 48, and I am not an overly sweaty person lol! Big let down for me. No7 Cleanse & Clear Eye Make Up Remover and Soft and Soothed Toner - I repurchase these every time Boots have a £5 OFF No7 deal on, the eye makeup remover is very oily but it makes mascara and eye makeup sooooo easy to get off. 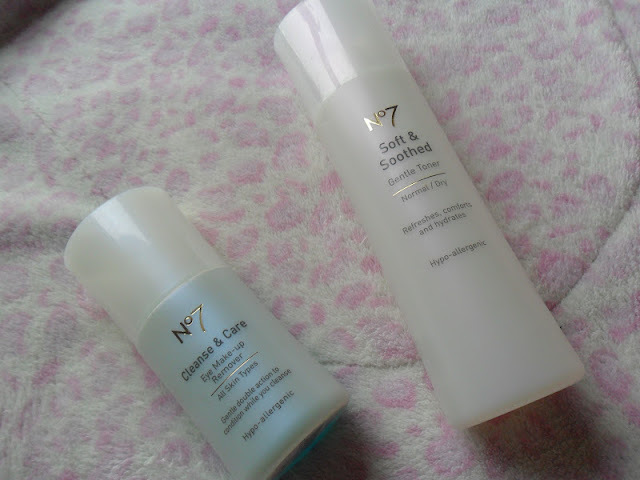 The toner is so refreshing and light, I always have back ups of these in my cupboards, these usually cost me £2-£3 if Boots are having a money off deal. John Frieda Tone Correcting Shampoo and Conditioner (link) - I posted about these last week, they are my new favourite shampoo and conditioner. 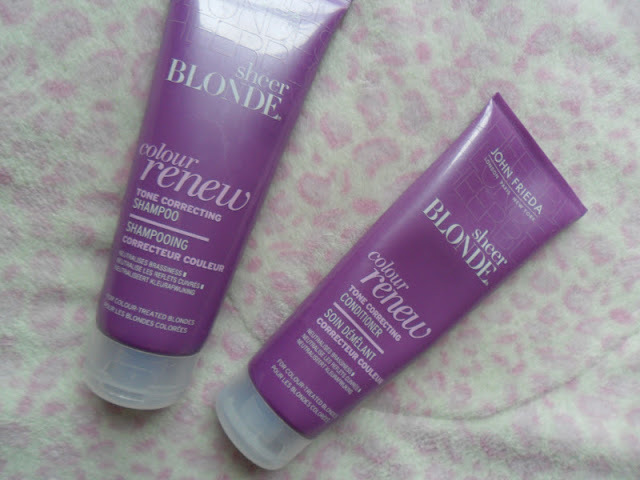 I won these in a giveaway and if I hadn't I probably wouldn't have tried them out, I am so glad I did as the tone of my hair is much brighter and less brassy, when I do run out of my giveaway win I will most certainly continue buying them, they usually cost around £5.00 each. Have you had any LOVES or HATES product-wise this month, I would love to know! Thanks hun. It's very steep for a primer isn't it. Rimmel is fab! What drugstore brands do you have in India hun?